....to my portfolio website. I hope to give you a little insight into myself and my work and hope you enjoy having a look around. ...here's a snippet about me...I started painting many years ago whilst living abroad. Over time painting and drawing flowers, fruit and vegetables developed from an interest into a passion. Most of my early work was produced using watercolour but after completing my SBA Diploma I turned to oil to try something different. My inspiration for working in oil paint was and still is based on Chiaroscuro, with early pieces worked in monochrome in order to focus on technique and how to achieve the accuracy I wanted in a very different medium. From small botanical pieces I was eventually able to develop onto working to a much larger scale and less botanical in nature. I now work in colour too and love the versitilty and forgiving nature of oil paint. Printmaking became part of my portfolio a few years later, starting with linocut then experimenting with etching, collagraph and monotype. Linocut has so far proved my favourite and recent work has focussed on reduction and multiplate techniques. When not working in the studio I like to go en plein air landscape painting, although I'll often work pieces up from sketches and photos in the studio too. 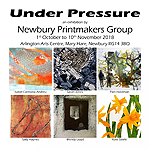 My next exhitiion - 'Under Pressure' - will be at Arlington Arts in Newbury as part of the newly formed 'Newbury Printmakers'. We are a collective of printmakers who work in a variety of techniques including: linoprint, etching, woodcut, collagraph, monotype and photopolymer gravure. Current members of the group are - Isabel Carmona Andreu, Sally Haynes, Wendy Lloyd, Pam Hardman, Sarah Johns and myself.